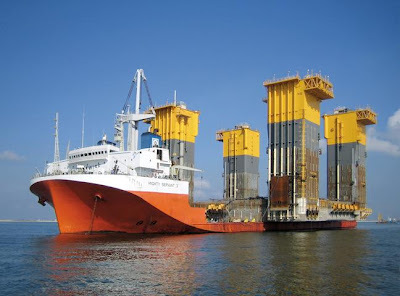 The vessel was operated by the Dutch heavy transport company Dockwise. Here is the press release about the sinking. Here is the vessel's homepage. 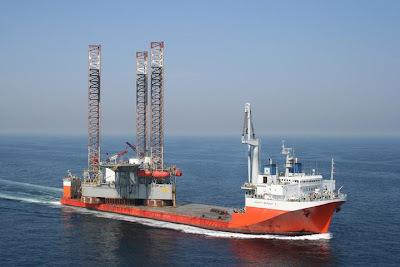 RigZone has a photo of the MIGHTY SERVANT 3 as it was sinking. Cargo Law is also promising pictures here. EagleSpeak has a summary of the USCGC STORIS, the oldest active cutter in the US Coast Guard. Sailors, Mariners & Warriors League has the verdict for four involved in the terror attack on the USS ASHLAND and the USS KEARSARGE. The Jordanians are not messing around with terrorists. They sentenced the four to Death. Navy Newsstand (US) has the story of a steam leak on the USS FRANK CABLE result in a number of serious injuries with one resulting in death. The International Transport Workers Federation (ITF) has coverage of the forced removal, under gunpoin,t of the crew of the Bahamas-Flagged CELTIC SEA in Ecuador. As it so happens, the owner is currently running for President of Ecuador. Marine Log has the European Commission's approval of a 4.2 million Euro state subsidy to modernize the German shipyard Volkswerft Stralsund which is owned by A.P. Moller-Maersk. Helsingin Sanomat covers Turkey's offer to open one port and one airport to ships and aircraft registered in Cyprus and the EU's rejection of the offer. (Some members have not rejected it.) Currently Cyprus registered craft are not welcome in Turkey as part of the longstanding dispute over Turkish-controlled Northern Cyprus. Scandinavian Shipping Gazette has an article concerning the need for Tallink to integrate the services of it's new purchases, Silja Line and SUPERFAST FERRIES, noting the problems that the Finnish Unions are causing on Estonian-Flag vessels. Ocra Worldwide has news of Dubai Ports "DP World" plan to invest almost $3 billion in a new port terminal in London, calling it the "London Gateway Port." Professional Mariner Magazine has the story of some concerns over the number of offshore wind farms near shipping lanes. SteelJaw Scribe has coverage and photo of the intentional sinking of the USS VALLEY FORGE, the first AEGIS-Class vessel to meet this fate. The BBC has a story on the increasing amounts of plastics in the world's oceans in both big and small pieces. So make sure your trash ends up in a trash can! YachtWorld.com has the for sale listing for the 128 foot NANTUCKET LIGHTSHIP, built in 1950 with an interior conversion done in 2004. It can be all yours for only $6.995 million. RigZone has the US approval of plans to deploy the first FPSO in the Gulf of Mexico. Islands Business has Tuvalu's concerns over less US fishing vessels taking advantage of a treaty between Tuvalu and the US to fish their waters. It is an issue of both losing fees as well as the difficulty in forging new treaties with other nations to allow their vessels to fish due to participation in a regional alliance. JordonCooper.com has the summary of attempts to build an aircraft carrier during WWII out of blocks of ice. Streetcode.org has the capture of the Venezuela-Flag Fishing Vessel OLIANA ONE which was carrying 2.9 tonnes of cocaine by the UK's Royal Navy with assistance of an USCG boarding party. Marex Newsletter covers problems with Massachusetts Maritime Academy’s current training ship the T/S ENTERPRISE. In a clear example that the EU is effected by market forces, Green Consumer Guide has a story that illustrates just how helpless the EU is at protecting it's own environment, setting catch quotas for fish species that it's own scientists are calling for ending all commercial fishing of as the stocks have collapsed. See also the WWF article here.